If you like this body of water, you’ll definitely like this other body of water. “I see you liked Bob on Tinder. You’d probably also like Shawn, Marcus and Alec.” That formula is thankfully, or depending on your perspective, sadly, not yet available on dating apps. But you probably recognize it nonetheless. It’s called “collaborative filtering” and it’s the algorithm that decides what you like online, then suggests a plethora of adjacent things—be it songs or shirts—that it’s determined, based on your demonstrated interests, you’ll probably like, too. A recommendation algorithm might not seem like fodder for innovative art, but Scott Kelly and Ben Polkinghorne have proven otherwise. The duo has gotten internet buzz for installing giant signs in idyllic spots around New Zealand that suggest, collaborative filtering-style, other tangentially related nature spots you’d probably like. One sign is on a beach, placed just barely in front of the ebbing tide. 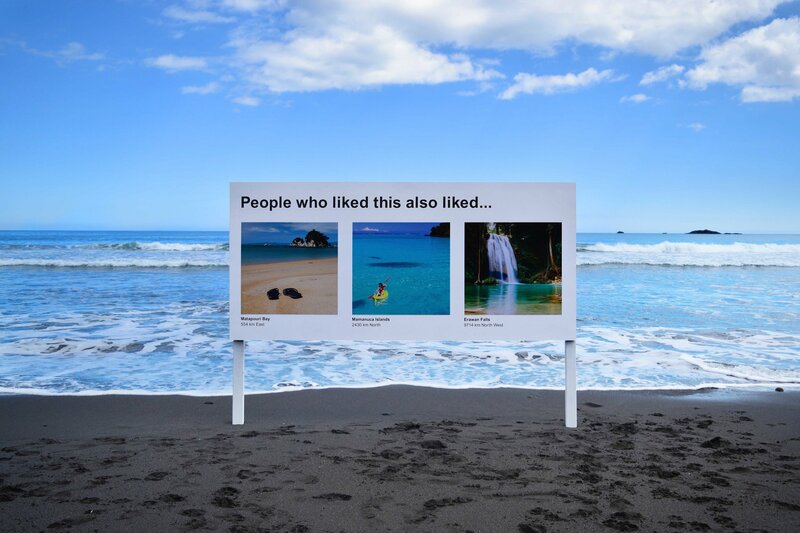 It reads “People who liked this also liked…” with subsequent suggestions of other bodies of water you’ll definitely love, because hey, you seemed to like this water! Another sign is wedged among flowers in a garden offering suggestions of nearby botanical gardens and the Australia Zoo. Kelly and Polkinghorne work together in creative advertising during the day. This is the second side project they’ve done, and they wanted the project to “give people a smile and make people think about them for a few seconds,” they told me via email. “These collaborative filtering algorithms are meant to help us. They aim to give us what we want. Sometimes that can be a good thing. Sometimes that can be a bad thing,” they wrote. The Signs of the Times are 4 meters, or 13 feet, wide and are still in place around New Zealand (except for the one on the beach, Kelly and Polkinghorne told me). After installing them, the artists told me they waited and watched to see how people interacted with them. “People came up to them, smiled and often took a photo. That was precisely the reaction we were after,” they wrote. Behind the scenes. Image courtesy of the artists. Collaborative filtering can also add to the “echo chamber effect” that’s been discussed so much lately. Like attracts like on the internet, and being referred to new things because you liked something similar compounds the problem, whether it be products or political views. The artists call attention to this too: “Perhaps you’re worried that as your life moves online and Alexa moves into your living room, your decisions are essentially being made for you. Perhaps you’re worried you live in a bubble. Perhaps you’ve never thought about it,” their artist’s statement says. Signs of the Times is a literal reminder to pause and think about the many ways the internet seeps into our offline life. The artists talked to me about this too: “Will there be a day in the future when we’re walking around in nature and our Google Glass (or the equivalent of) automatically gives us other nature suggestions nearby? Of course there will be. Amazon’s Alexa is already inside our living room. Siri’s already inside our pocket.” In the meantime, may we suggest you get offline and enjoy the world around you while it’s still (relatively) free of Internet influence? See all of the signs on their website here.